I can’t believe it is already the 22nd of February. The time is really going by so quickly. I am definitely getting to the final weeks of my pregnancy. I’ve gained just the right amount of weight and the ADORABLE BABY does move around a bit and even gives a little ‘kick’ now and then. This is all TOO CUTE! As I’ve mentioned in earlier Diary postings, I was put under ‘foal watch’ on February 1st. This is done so everyone at the farm is monitoring ME each day very closely to observe everything going on with my body. From what I am being told (as I have not done this before), my body will start giving signs as the big day gets closer. It is a natural progression of things that will take place until the time I am ready to give birth. As MY JOHN was commenting to Dottie, this is the exact way you would want things to happen….a slow changing of the body to get ready for the big day. You do not want things to happen all of a sudden or too quickly. You want to observe and note the subtle changes. One of the first things that begins to happen is the forming of a small ‘bag’….which gradually increases in size. This begins to develop so there will be enough milk to nurse the baby properly when he/she is born. This is very important! I am happy to report that per my last evaluation….I am starting to do this. My ‘bag’ is about the size of a “small marshmallow”, per the farm. I will keep you posted. I have time yet to go and my due date of the first part of March continues to be ‘on target’. It is all so exciting! Snow, snow GO AWAY…fall up in the mountains for the skiers. I wish there was a way to direct the snow away from paved areas so it would just fall on the ground. We’re way above average for snowfall and we’re just approaching March, our traditonally snowiest month. Yikes!! Zenyatta, it sounds like your pregnancy is coming along really well. You have all these people looking after you all the time to make sure nothing goes wrong. I am really happy to hear all this. I can’t wait until your foal is born. 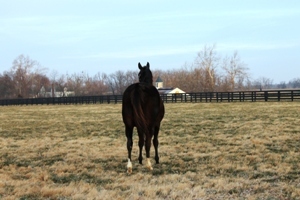 Ditto Tasty Temptation’s foal. This must be really exciting and nerve wracking for both of you.